Making a rare appearance on the carpet, M.I.A. attended the premiere of MATANGI / MAYA / M.I.A. yesterday(September 19th) at the Curzon Mayfair in London. 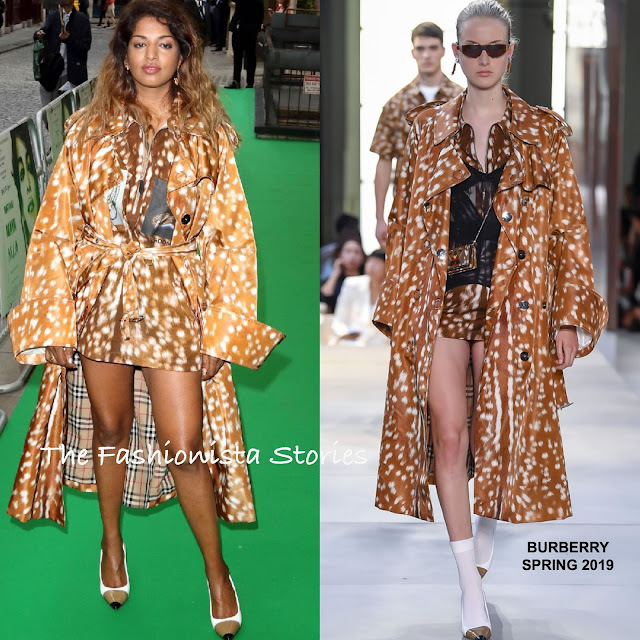 Working s look hot off the London Fashion Week runway, she wore a BURBERRY SPRING 2019 brown & white trench coat with the matching mini dress underneath and ti-color toe cap pumps. I feel like this look has potential but needs to be edited because the pieces in general are great but feel overwhelming here. I want to see the dress without the trench and the hair completely off-the-shoulders. Does M.I.A. 's look work for you?